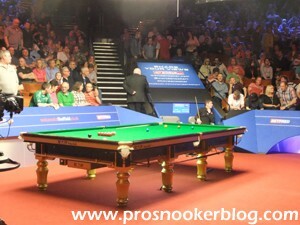 With each passing year at the Crucible it has become ever more apparent to me how for the seeds, the first round is more a matter of survival than anything else and how dangerous it is to draw any firm conclusions as to form. On the basis that both Judd Trump and Shaun Murphy are able to convert 7-2 leads into victories later today, there will have been only three seeded losers in this year’s first round, which with the exception of 2009 is the lowest amount since 1996. Whether this is due to the new qualifying format, which saw all of the qualifiers play three matches last week in order to make it to the Crucible, or is simply a measure of how strong the top 16 are at the moment is up for debate, but it does help to set up a great list of second round ties. In terms of the contenders, I was impressed by Mark Selby’s performance against Kurt Maflin, which despite seeing the defending champion lose five frames in a row at one stage, I thought was generally strong. A big break in the opening frame helped him to stamp his authority on the match early on and as is his trademark, when he was under the most pressure, he was able to produce his best snooker. He could meet Neil Robertson in the semi-finals, which would be a repeat of what was an epic encounter last year and the Australian impressed by making what is so far a tournament high break of 143 in a 10-2 victory against Jamie Jones. 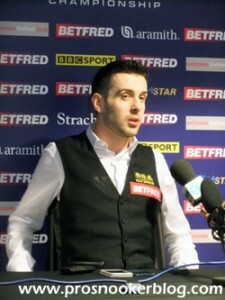 Make no mistake, there is still room for improvement from the 2010 champion, but it was a strong start and I do think that he will be pleased to have been bumped down the rankings slightly by Ding Junhui in Beijing, with the result that he moved up into the top half of the draw, away from the likes of John Higgins and Judd Trump in the quarter-finals. 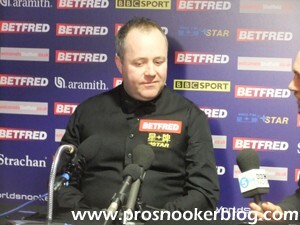 I did not see much of Higgins’ victory against Robert Milkins, but Milkins was generous in his praise of the four-time champion and without doubt he has recently been playing as well as he has for at least two seasons. For that reason, many are tipping him to cause what would be an upset with the bookies at least in the second round, to defeat Ding Junhui and make it through to the quarter-finals for the first time since he last won the event back in 2011. 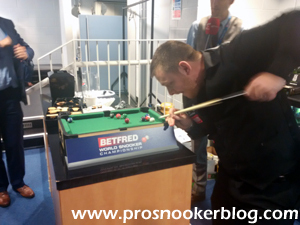 While I would not be as quick as some to write Ding off here at the Crucible, it is fair to say that he will have to improve markedly upon his opening round performance against Mark Davis, if he is to make it to the second week here in Sheffield. Though he eventually ran out a relatively convincing winner, he started slowly and with a stronger performance from his opponent, he could have found himself on the wrong end of another early shock here. Though not through to the second round just yet, both Judd Trump and Shaun Murphy did what they had to do yesterday in opening up five frame advantages over their lower ranked opposition, who both failed to settle against two of the tournament favourites. I would expect both to confirm their progress to the second round later today and Judd in particular is a player who a lot of people are tipping to come of age this tournament and lift the world title for the first time in his career. If he is to do so, it may be that he will have to defeat five-time champion Ronnie O’Sullivan in the semi-finals and the Rocket was another routine winner yesterday, without ever really producing his best snooker. O’Sullivan though has been here and done it enough times and as I suggested in my piece yesterday, clearly had more in the tank and would have been able to raise his game had he been required to. Of all the players, Ronnie is perhaps the one who I would read the least into his first round performance, as it will not be until he is against a more seasoned opponent that we will really get a feel for just how he is playing under pressure. Next up for him will be Matthew Stevens, who played well, but perhaps not as well as a 10-2 scoreline against Mark Williams would suggest in his first round match. It has been a tough couple of years for Stevens, who has dropped as low as 35th in the rankings, but he seems to be in a better place mentally at the moment and I think could push O’Sullivan a little closer than some might expect, although I would be very surprised to see the Welshman beat him. 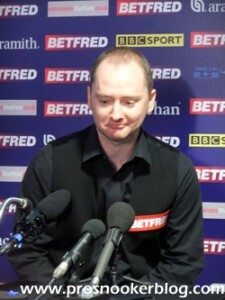 Along with Stevens, Graeme Dott is another of the qualifiers to come through their opening round match and given his record here at the Crucible, I would not be at all surprised to see him pull off another good win against Stuart Bingham in the second round. 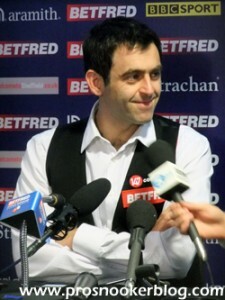 It promises to be a close match, just as their match at the UK Championship earlier this season proved to be, but with the longer format and Crucible history to be added to the mix, I think that we might just see Graeme come through to set up a repeat of the 2004 final with O’Sullivan in the quarters. 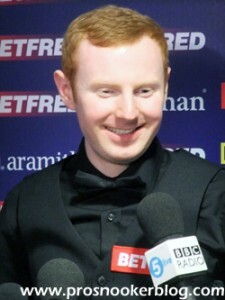 The final remaining qualifier in the draw is Scotland’s Anthony McGill, who exuded confidence during his opening round win against Stephen Maguire and I feel will keep Mark Selby honest in the second round. Whether he will have enough in the tank to be able to win is another matter, but whatever happens it will not be the last time that we see the young Scot here at the Crucible, of that I am sure. Two players who have perhaps come into the tournament somewhat under the radar are Mark Allen and Barry Hawkins, who meet in a repeat of their dramatic 2011 second round match when I recall that Hawkins hit the blue from his break-off in the deciding frame and Allen cleared to win. Hawkins has struggled for form this season, something that he elaborated on during an interesting press conference following his opening round win, but seems to be on the right path again now and with his excellent recent record here at the Crucible will give Allen a good game. For Mark it has been an interesting season, a better one than he seems to be given credit for and despite what I have said about Allen above, he could have had a worse draw as he looks to make it through to the quarter-finals for the first time in four years. 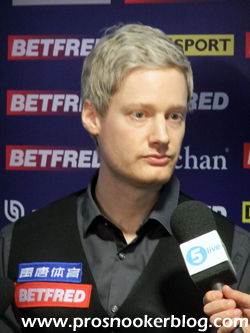 He looked to be in early trouble against Ryan Day a couple of days ago, but the wheels came off for his opponent at 3-1 and Allen played well to book his place in the last 16. And finally a mention for Ali Carter, who opened with a century break and never really looked in danger against a tricky opponent in Alan McManus. As much as his battle with cancer earlier in the season deserved the attention that it got from the press, there is now a sense that he is looking to leave that behind and concentrate on trying to win the title this week. A former two-time finalist of course, who is to say that he cannot go all the way in Sheffield this year?